Overview. Historical Background of the CR Paradigm. Animal Taxa Studied. Study Designs. Anti-Aging Action. Dietary Factor. 2. Mortality Characteristics. Survival Curves and Related Data. Gompertzian Analyses. Age of Initiation and Duration of CR. Temporal Pattern of Food Intake. 3. Molecular and Cellular Biology. Stability of the Nuclear Genome. Gene Expression. Mitochondrial Function. Membrane Structure and Function. Protein Structure, Function, and Turnover. Cell Proliferation. Apoptosis. Cellular Signal Transduction. 4. Organismic Physiology. Body Composition. Nervous System. Locomotion and Skeletal Muscle. Cardiovascular System. Endocrines and Metabolism. Reproduction. Body Temperature Regulation. Immune Function. Wound Healing. 5. Age-Associated Diseases. Cancer. Kidney Disease. Cardiovascular Disease. Diabetes. Neurodegenerative Disease. Immune Disease. Cataracts and Glaucoma. Osteoarthritis. 6. Mechanisms of Anti-Aging Action of Caloric Restriction. Oxidative Damage Attenuation. Alteration of the Glucose-Insulin System. Alteration of the Growth Hormone-IGF-1 Axis. Hormesis. 7. Evolution of Anti-Aging Action of Caloric Restriction. Evolutionary Biology of Aging. The Female Reproductive Life Span Hypothesis. The Energy Apportionment Hypothesis. The Hibernation-Like Hypothesis. Computer Modeling. Testing Hypotheses. 8. Caloric Restriction Mimetics. Chemical Agents. Alteration of Physical Activity. Genetically Engineered Mice. For many years, it has been known that when rats and mice are given a reduced amount of food, their life span is increased and they remain healthy and vigorous at advanced ages. What is the reason for this change in the usual pattern of aging? The evidence is overwhelming that the life extension results from a slowing of aging processes. And the factor responsible is the decrease in caloric intake. The obvious question: How does this factor work? A good question - and the reason that research on the anti-aging action of caloric restriction is today one of the most studied research areas in biological gerontology. For it is felt that if the biological mechanisms of the anti-aging action of caloric restriction can be uncovered, we would gain an understanding of the basic nature of aging processes, which would, in turn, yield possible interventions in human aging. 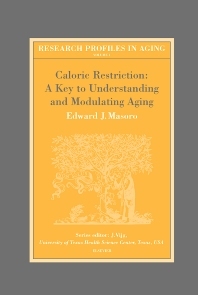 This book aims to provide the growing number of researchers in this field (faculty, postdoctoral trainees, and graduate students) with a detailed knowledge of what is known about caloric restriction within the frame of gerontology, as well as insights on future of this field.